Available via mailorder for $12. "The Lassue Yous could be thrown into the same category as The Salteens: sugar pop, with lots of handclaps. Their influences are obvious when you listen to their songs, from the Beatles to Sloan to the Superfriendz." "What can I say? when you put brothers together in a band you get great vocalizing harmony...its been proven time and again with the everly brothers, the beach boys, and haha NELSON (j/k but i had to throw those guys in there!). Anyways, a happy up beat song, along with the always effective handclap, made famous by the boys in Sloan, makes for a pleasure to the ears." "Do you miss that happy '60s/70s super pop rock sound, like The Partridge Family? Well, sit down, grab some kool-ade and say hello to the Lassue Yous. For 49 minutes, these fine young lads will be your best friends. The song that sums it all up is #12, Count on Me. It's my personal favorite. I'm sure they won't mind of we sing along." "In the sleepy suburb of Hamilton which is home to the Cactus Festival, the Driving Park and eccentric shop owners, three musicians grew up under the same roof. The words "Dundas" and "scene" may seem a little incongruous when first placed beside each other, but there are a number of bands bubbling up there including Little Red Wagon, The Ernie Thompson Experience and, probably the most widely known of the three, The Lassue Yous. It is this third band which I have chosen as the subject of my weekly appreciation of less hallowed or trumpeted, but nevertheless very talented, Canadian musicians. 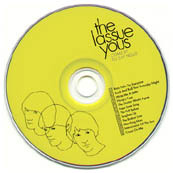 In 1998, brothers Joel (guitar/keyboard/vocals), Ben (keyboard/vocals) and Adam (bass/vocals) formed the Lassue Yous. I first saw them play last winter when they opened for The Candidates at the Raven. Unfortunately, it was kind of a crazy night and there were some long pauses between their sets, but what I did see and hear of them strikes me now as fairly unique. There are many bands who have caught the '60s/'70s pop fever, and I would suggest that there are very few bands who are not in some way influenced by the Beatles. There is the occasional group, however, whose influences seep so vividly into their music that they seem almost to belong to another era. You can hear the Beatle-based pop in a band like Belle and Sebastian, but it's much edgier and ironic and is not possessed of the straightforward and often idealistic lyrics of Beatles' songs. On the other hand, a band like the Lassue Yous seem to capture more of the idealistic spirit associated with pop in the '70s and '80s. The spirit which sometimes appears a little too happy-go-lucky to us now and is often relegated to the dubious category of "camp appeal." Included in this graveyard of apparent superficiality are the likes of the Monkeys, the Partridge Family, ABBA and the band everybody loves to hate, Supertramp. There's a reason why some of these bands gradually crawled from our television screens and radios into indefinite obscurity, but Supertramp still gets regular radio play on classic rock and mixed music stations, which proves its staying power. ABBA also made a comeback a number of years ago during that brief period in high school when it was cool to resurrect your Dad's bellbottoms and have retro theme parties. The broadway musical Mama Mia also reveals a resurgence of our on-again off-again love affair with '70s pop. In the midst of these unpredictable displays of whim, the Lassue Yous have found a good thing and stuck with it. Their revival of an old gem has proved unique in terms of their approach to it, which more or less steers away from deliberate irony or trendiness. Among their influences, the Lassue Yous count Supertramp, the Who, ABBA and Queen. Sweet harmonies and hand-claps capture the operatic nature of a band like Queen and the sugar-pop sounds of ABBA. 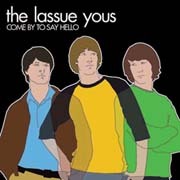 The Lassue Yous, independent since 1998, have received acclaim in Chart magazine and airplay on Toronto's The Edge 102. They currently have an eponymous EP under their belt, as well as a full-length record, Come By To Say Hello. More recently, they have contributed to Hot Tub Records' The Amalgamation Compilation alongside Chore, Kitchens and Bathrooms and Sara Somebody. Their increasing popularity without the muscle of a major label behind them reveals the relevancy of the music they are making, as well as the potential for freshness and innovation in the context of the revival they are undertaking.